He tried to outwait the hunger, but it grew instead of going away. If the hunger wouldn’t leave, then Gray Tail would have to. One day, Mama Cat didn’t come back to her nest under the porch. She didn’t bring warm mice, freshly caught, for Gray Tail and his brothers to eat. She didn’t wash their faces and scold them for scuffling. She didn’t settle down, all warm on her side, for them to cuddle up next to. She simply wasn’t there at all. Gray Tail was hungry and his brothers cried. One by one, his brother kittens left the nest, venturing out of the safe, enclosed, darkness and into the wide, open, brightness. They didn’t come back either. Gray Tail was left alone and hungry. Cautiously, Gray Tail crept out from under the wooden slats of the porch. He flattened his tabby body against the ground, creeping so slowly that he didn’t make a sound. No one watching would even see him move. Gray Tail didn’t know who he was hiding from — whoever had taken Mama Cat and his brothers, he supposed. Unfortunately, the metal cage that waited for Gray Tail on the other side of the opening under the porch didn’t need to hear him or see him move. No matter how slowly he lowered his paw onto the catch, when his weight shifted, the trap snapped shut. Terror, yowling, hissing, and rattling the cage. Pink hands came, lifted the metal cage, and carried it, swinging, through the air. The light changed from raw white to curdled gold. Gray Tail had never been inside a human house before — only under one. The pink hands pulled Gray Tail out of the cage. He scratched them several times, before they wrapped him tightly in a rough, blue towel. “Poor Kitty,” the owner of the pink hands sang, cooing to Gray Tail. The hands stroked him and molested his ears. He didn’t want the hands to touch him. When the hands finally set Gray Tail free, he darted for the nearest dark corner he could see — an open cupboard under a sink. His brothers were there! And a bowl of food! Gray Tail bumped his head against his brothers — all three of them — and then he settled down to eat, purring much too loudly for happiness. His purrs were frantic, desperate. Let me be safe; let me be warm; let me be. The hands did not let Gray Tail be. Each kitten by turns was pulled out from the cupboard, wrapped in a towel, scritched, and bothered daily. Sometimes, the towel was loosened, but Gray Tail learned that if he used the opportunity to scratch and bite the hands, the towel would be rewrapped too tightly for him to move. Gray Tail learned not to scratch and bite. But he didn’t learn not to hate. Gray Tail’s brothers didn’t hate the hands. They pressed their heads against the scritches, arched their backs, and bared their bellies. They relaxed and let their guard down. So, of course, the hands made each of them disappear. Gray Tail lived in the house, avoiding the hands who called him Simon. He slept under the couch, hid behind the washing machine, and only came out to sit on window sills when he knew the hands were gone. Gray Tail refused the shiny objects and fish-smelling treats that the hands dangled for him. He would not be lured out from his safety. He could forage for himself — when the hands were gone, he always found bowls of food waiting for him. He didn’t need the hands. He didn’t need their barbed charity. Gray Tail learned the borders of his cage well. The windows showed him a world free from the tyranny of the hands, but he could not get there. Then, one day, the hands brought out a plastic and metal box that reminded Gray Tail of the cage they’d use to trap him before. He didn’t know what new horror might lie on the other side of this new cage, but he didn’t want to. His fur fluffed; his back arched; he hissed. Gray Tail didn’t understand the voice of the hands, but he hated it when they said Simon. He ran for the couch. But the hands followed him to the couch, carried there by stomping feet. The couch flew upward, revealing Gray Tail. He ran and hid again, but the stomping feet followed him. Every piece of furniture moved at the behest of the hands. Nowhere was safe. Finally, cornered behind the washing machine, Gray Tail had no choice. The hands came at him, and he abandoned his training — he scratched and bit, fighting for his life. The voice of the hands screamed, and Gray Tail smelled blood in the air. He cowered behind the washing machine, his last line of defense, and listened to the voice of the hands. When he came out from behind the washing machine, hours later, the door to the washing room was closed, but one of the windows was open. Cold air blew in, fresh from outside. Gray Tail had never felt more triumphant than when he jumped through that open window. Outside was filled with exciting, skittering creatures — bugs and mice and squirrels and birds. Gray Tail knew how to catch none of them. He had to live on the same sorts of bowls of food he’d scrounged for himself inside the house of the hands — they appeared out here too; once a day, beside the door to the hands’ house. But Gray Tail watched the tantalizing creatures. He chased squirrels and pounced on spiders. He chewed on sour grasses and sweet flowers. He slept in sunlight, unfiltered through glass. He ranged through the neighborhood, free and unfettered. Except, of course, for his need to return for the daily bowl of food. The weather turned. Sunlight was still bright, but it didn’t warm Gray Tail like it used to. Then, day by day, the sunlight went away — the sun barely rose, and clouds obscured its brilliance. Everything was dark and cold. Snow fell. Rain followed, covering the trees and snow in ice. Gray Tail shivered, shielded from the snow and ice, waiting for the cold to leave. But like his hunger had grown, the cold grew. It held him tightly; it held him still, like the blue towel that the hands had wrapped around him. The cold grew until it was bigger than him. It grew until he stopped shivering. Gray Tail dreamed that the earth opened up beneath him. It cracked wide, and he plummeted down into the dark. He landed on paws that were still numb with cold but burned at the touch of the ground. He heard cats crying in the distance. A chimera approached from the flickering shadows — it had the body of a cat, but instead of a single cat’s head on its shoulders, three strange heads sprouted — one like Mama Cat’s, a second like a mouse’s with teasing laughter in its eyes, and the third was a giant pink hand. Gray Tail stepped toward the shadows, but each step burned his numb paws worse. He smelled fire, and his whiskers sizzled as if the very air singed them. In the shadows, he saw the crying cats writhe and twist. Their bodies moved unnaturally, vaguely cat-shaped but broken. Giant mice stood over them, jabbing the cats with spears and tridents. “Or can you be tamed?” The pink hand sprouting hideously from the chimera’s shoulders pointed behind Gray Tail. Gray Tail looked that way, but all he saw was a path leading into darkness. “Until you choose, you will remain in purgatory,” the chimera squeaked with its mouse head, “You will be Cold Tail.” The mouse head laughed, cackling evilly. The earth shook under Gray Tail’s paws. He turned and fled toward the path, away from the crying cats, away from the chimera, and away from his choice. Gray Tail awoke in his nest under the porch, colder than ever. He roused his stiff limbs, stretched, and paced restlessly under the porch. The ice and snow made him feel trapped. He had to leave. He had to be free. Gray Tail came out from under the porch. He walked over the snow, stepping so lightly his paws left no prints. He wandered the neighborhood, enjoying his freedom, even though the cold gnawed at him. When he returned to the house of the hands, Gray Tail found that the bowl of food by the door held no appeal. Neither did the dead mice he found, frozen by the ice storm. Gray Tail ate no more. When the snow thawed, his paws left no tracks in the slush and mud. He didn’t bother squeezing through the hole to his nest under the porch any more; he could walk right through the planks. When the sun shone on Gray Tail, it didn’t warm him. It didn’t touch him at all. It passed right through him, and he cast no shadow. Days and weeks passed; the days grew longer; but Gray Tail never grew warmer. 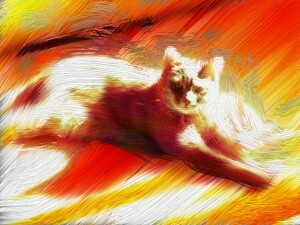 Sometimes in his dreams, Gray Tail felt a burning in his paws and smelled fire. He heard the broken cats crying for him to join them. But he held still until he awoke again, cold but free. He wanted nothing of the warmth of hell. The name was like a tether to his heart, tugging him to come closer. It fought against the fear and hate, warring to melt the cold that filled his ghostly, incorporeal cat form. He hid in the bushes when the hands came to the front door and called to him, holding a bowl of food. When the hands gave up calling, “Here kitty, kitty!”, they left the bowl of food lying on the ground. They went back inside and closed the door. Gray Tail crept out of the bushes, came up to the bowl, and sniffed the food. He wasn’t hungry, but the smell of the food felt warm in his belly. He decided to follow the hands inside. He walked right through the closed front door. Gray Tail had never entered the house of the hands by his own free will before. It looked different to him, knowing that he could leave by any path, none of the walls could hold him. But they could hide him. The hands still scared him, so Gray Tail kept his distance, following them from room to room, hidden inside the walls. When the hands lay down to sleep that night, Gray Tail came out of the wall and jumped onto the bed. His weightless paws made no indentation in the covers, but his presence wafted over the body of the hands like a cool breeze. The hands pulled the covers tighter. Gray Tail crouched beside the head of the hands and watched its slow breathing and the flickering of its eyes. He’d never looked at the face that called him “Simon” before. It was pink and naked, oval and knobby. Completely unlike Mama Cat’s face. But it had eyes. When the eyes opened in the morning, they were brown and warm. Gray Tail was so busy looking at them, he didn’t notice the hands moving, rearranging the blankets. One of the hands passed right through him. It burned like fire. Gray Tail startled and jumped off of the bed. He watched the hands move around the room, opening drawers, taking out clothes, fixing the bed. For the first time, he also watched the brown eyes. They didn’t look at him. The looked at the hands, mostly. Gray Tail hid in the bedroom wall until the hands left the house for the day, but he didn’t leave the house. It was warmer inside. When the hands and eyes came home that night, Gray Tail followed them more boldly from room to room. He began to hope that the the eyes would see him. He wanted to be looked at. He wanted to feel real and acknowledged, no longer a cold shadow, a mere ghost of a cat. The hands cooked dinner. They chopped onions, peeled potatoes, and fried a fish. The fish smelled sweet, but the only hunger in Gray Tail’s belly was for the warmth he remembered seeing in the hands’ brown eyes that morning. The hands and eyes went back inside. Too late, he’d learned to see the hands for what they really were — generosity, companionship, and warmth. He saw the eyes now, but the eyes did not see him. Gray Tail cried, a sad meouwl, a haunting sound that carried across the ethereal planes separating him from the living world. His cry said that he was ready to choose, ready to change, ready to be Simon. His cry called the hands back to the door, and when the hands opened the door, the eyes looked down. Brown eyes saw the the shadowy, translucent figure of a gray tabby. Gray Tail meowed and wove between the hands’ feet again. The hands stood there for a long time before moving, but then the hands came down and reached to touch Gray Tail. He didn’t shrink away. The hands were warm where they passed through his body, and he wondered how he had ever hated them. Gray Tail followed the hands inside the house, purring, and jumped onto their lap when they sat down to hold a book. He curled up, feeling safe. Finally, all the cold melted out of Gray Tail. He fell asleep and dreamed that his eyes, Mama Cat’s eyes, and the brown eyes of the hands all turned into stars and rose into the sky. The six stars — and many more — locked into a perfect constellation, always seeing each other, never alone, forever above the fire and cold on the mortal plane.